MOORESVILLE, N.C. (June 26, 2017) – After some up-and-down weeks for Cunningham Motorsports, Shane Lee and Dalton Sargeant seemed to get right back on track at Madison International Speedway Friday night. 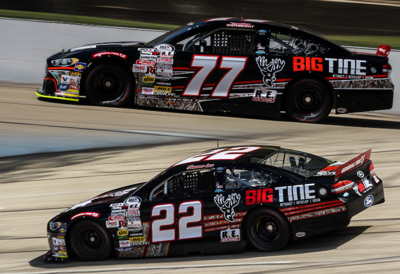 Lee rebounded after weeks of bad luck to come away with a fourth-place finish while teammate Sargeant earned his first General Tire Pole Award and a sixth-place finish in the Montgomery Ward 200. From bad luck starting back at Toledo, Lee was determined to turn it around at Madison. Starting in the ninth position, the 23-year-old quickly moved up to eighth where he stayed for majority of the first half of the 200-lap race. Four cautions would come and go before Lee came in to pit road with the leaders on lap 75 to for new right-side General Tires and adjustments. By lap 85 Lee quickly moved up to seventh where he bounced around the top-10 until another caution fell on lap 157. After a quick stop for four new tires, Lee jumped from tenth to fifth and with 10 laps to go, he made his move to overtake fourth-place, giving him his fourth top-five finish of the season. On the other side of the Cunningham team, starting from the pole, Sargeant battled lap traffic to maintain the lead until a caution fell on lap 14. For multiple laps after the restart, the 19-year-old drove door-to-door for first, ultimately holding on to the top spot until lap 31 when he fell back to third. From there Sargeant rode within the top-10 until a mid-race pit stop came at lap 75 for new General Tires and a slight track bar adjustment, giving Sargeant what he needed to break back into the top-five. Running with the leaders by lap 125, Sargeant would get shuffled back to ninth, ultimately fighting his way back to sixth where he held on for his eighth top-10 finish of the season. Cunningham Motorsports will take a weekend off before heading to Iowa Speedway for the Fans with Benefits 150 on July 8. Until then, keep up with Cunningham Motorsports on Facebook and Instagram (@CunninghamRace) and on Twitter (@Cunningham_Race). Head to www.cunninghamrace.com for more news. You can follow Shane and Dalton on social media as well. Follow Shane on Facebook and Twitter (@ShaneLeeRacing) and on Instagram (@Shane_Lee00). Follow Dalton on Facebook (@DaltonSargeantRacing) and Twitter and Instagram (@DaltonSargeant). Big Tine is manufactured in Rockville, Ind. and was introduced to the market in 2010. Big Tine is the only feed supplement on the market that utilizes the power of Whitetail InstitutesTM 30-06 mineral and vitamin supplement for year-round support management of a healthy, flourishing herd. For more information on Big Tine, products or where to buy visit us at www.bigtine.com on Facebook @BigTine and on Instagram @BigTineOfficial.